From Anonymous of Muskegon , Michigan on 3/14/2019 . Happy to have found your site as I am no longer able to find your pickles in my area. Love candied dills and the others in the same type. Will order again. From Anonymous of Seattle, Washington on 3/11/2019 . Let's be honest, people who have never tasted these think that they sound weird - but once you have tried them, you miss them in tuna salad, deviled eggs, tartar sauce, potato salad, on hamburgers... The list goes on! So glad I can get this taste of home delivered to the Pacific Northwest! Shipping was fast and secure. From Anonymous of Altadena, California on 11/25/2018 . From Connie J of Ft. Wayne, Indiana on 11/12/2018 . 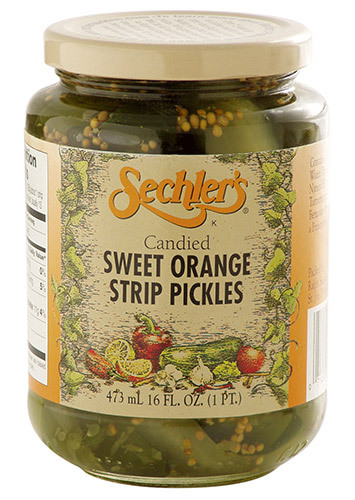 My family has tried many of the different Sechler pickles but we always keep coming back to the candied orange strips.! Best pickles ever! From Connie Graves of Athens, Alabama on 10/18/2018 . Have used the Candied Strip pickles for years and Love them. This is the first time I've ordered the Orange......Love them Too!